The place was packed as you would expect on a weekend, and our cosy corner table was thankfully ready shortly after we arrived. The brunch menu is quite extensive, and as is the norm with our family, we ordered dishes to share, which is always the best way to go. We started with some appetizer dishes to share, including the Truffled Mac & Cheese with creamy Parmesan sauce with crispy kale topping, and Crunchy Chorizo Prawns served with mango chilli mayo. The Salt & Pepper Squid was light and crisp, served with crispy rice vermicelli noodles and tangy house sesame & lime sauce. The Entrees and Steaks & Grills all sounded very enticing, but we eventually managed to narrow it down to three dishes. The Whole Nova Scotia Lobster was a no-brainer – juicy chargrilled lobster, served with smoked garlic and herb butter, watercress and fries. We also ordered the Blue Swimmer Crab Cakes which I enjoyed on my last visit, coated in golden brown breadcrumbs, with chilli, radish slaw & chipotle sauce on the side. And of course we didn’t miss out on the Smoky Rye-glazed Pork Ribs with spicy slaw and fries. A delicious and tender rack of ribs that is definitely one for the meat-lovers out there. We ordered a portion of the Buttermilk Pancakes with blueberry compote & house whipped cream, which were thick and fluffy, although we found it slightly dry and could have done with a bit of syrup. The Pecan Pie had a nice buttery pastry with sweet crunchy pecans, served with rye whiskey ice cream. My favourite was the Melting Chocolate Sundae – topped with a chocolate dome which melted as the warm butterscotch sauce was poured on top of it, revealing creamy milk ice cream and indulgent chunks of chocolate brownie pieces underneath it. Naughty chocolate desserts like this are always a winner. Tummies filled and smiles all round the table, which is usually a good sign of a satisfying brunch. 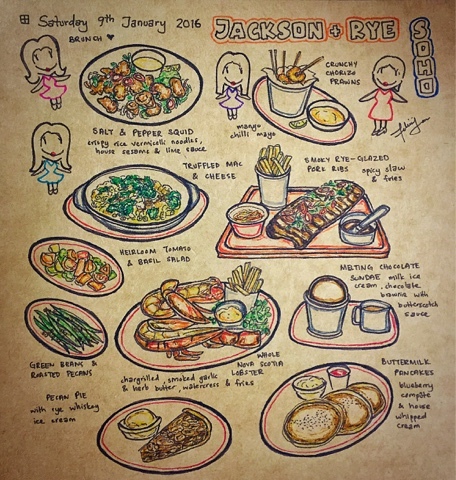 Thank you Jackson & Rye for a pleasant meal, I look forward to returning soon. Ooooh that pudding looks amazing! Those puddings look so good! Yum.